How does the Poker Welcome Pack work? How does the 200% deposit bonus work? How does the Free €5 MTT Token work? How does the week of free Wild Twister work? Welcome Mission 2 — Play on 10 separate days in your first month and get a €5 Twister Token. 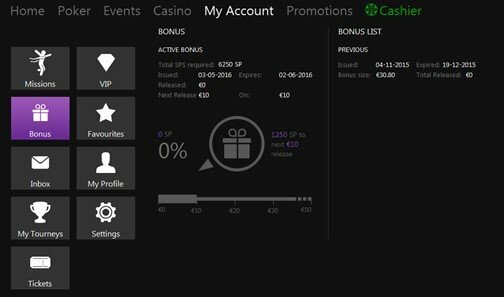 Status Points are calculated as follows: Cash/Ring Games = 25 Status Points are awarded for every €1 of rake paid. Sit ‘n’ Go Tournaments = 25 Status Points are awarded for every €1 paid in fees. Multi-Table Tournaments = 25 Status Points are awarded for every €1 paid in fees. Do I need any more information about this Poker Welcome Pack? The Welcome Pack is limited to one account per customer – meaning one per family, household address, IP Address, email address, telephone number, payment account number (e.g. debit or credit card, Neteller etc), and shared computer, e.g. public library or workplace. By using the free tokens, you are giving us permission to use your Poker nickname in marketing materials. Unused tokens will expire after 45 days and will not be redeemed except in the applicable tournaments within the promotional period. Betfair Poker reserves the right to modify the terms of this offer, to discontinue it at any time or to amend these Terms and Conditions without liability and without notice. Betfair shall not be liable for any damages howsoever arising as a result of any such modification, alteration, discontinuance or termination of the Promotion.